Now what you see here is normally something which most of us would more or less discover when we read comics or watch a cartoon. 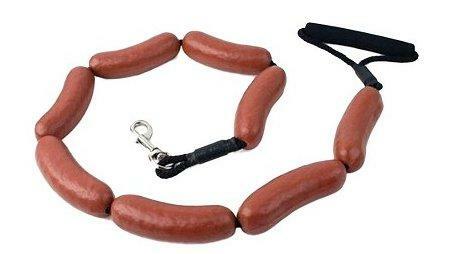 The $13.99 Sausage Link Dog Leash is definitely a hoot whenever you lay your eyes on it. After all, how is it possible not to laugh at it? Sausages are a yummy treat, whether eaten by a human or by one of man’s best friends who gets around on all fours. The Sausage Link Dog Leash might not set of the Pavlovian reaction of your pooch drooling like there is no tomorrow, but it would certainly send heads turning into your direction whenever you bring Fido out for a walk. Who knows? It might just be the conversation opener that you have been looking for all this while but never really managed to wrap your finger around it.